Legacy Mountain Lazy Bear has all the essentials to make you feel at home, plus fun perks to keep you entertained on days around the cabin. 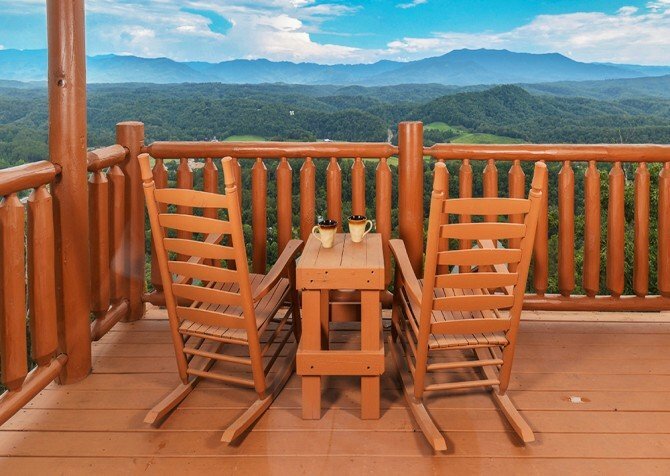 The Pigeon Forge cabin is comfortable and well equipped, with views that will keep you rocking on the porch for hours. Legacy Mountain Lazy Bear is also a duplex connected to Legacy Mountain Magic, and both are equally stylish, comfortable, and fun. 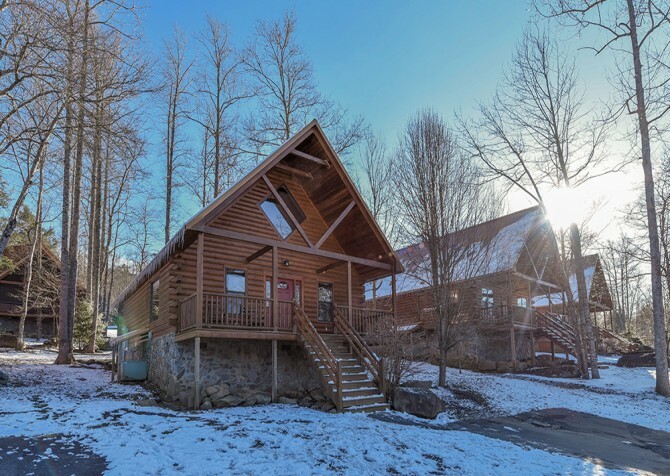 Book both Legacy Mountain Lazy Bear and Legacy Mountain Magic, and you’ll have 2 great spaces with 2 theater rooms, 2 game rooms, space to sleep up to 12 guests, 2 fully equipped kitchens and dining space for 8+, and 2 beautiful decks with awesome views! With some extra privacy while keeping you nearby, it’s a great option for several couples, a group of friends, or 2 families! After busy days, you can head back to the cabin to relax. 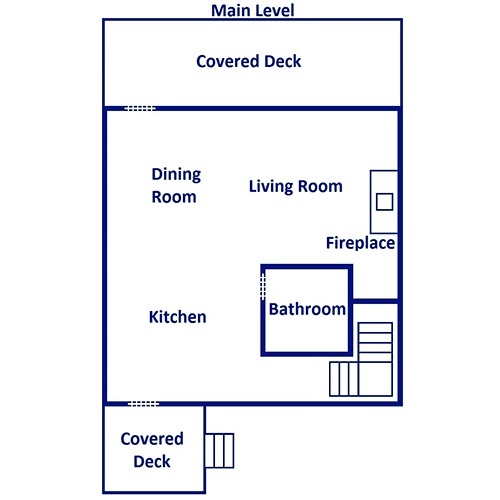 This 1-bedroom, 2-bathroom cabin for 6 is comfortable and inviting. Cozy up in front of the fire and big screen TV in the living room, play pool and arcade games in the rec/theater room, flip on the 65-inch smart TV and Blu-ray player for movie night in your theater-style seats, grab a drink or a book and sit back in the rocking chairs on the deck, soak in the outdoor hot tub with a TV, or climb into a comfortable king-size bed for some much-needed rest. The cabin also has lots of conveniences to make you feel at home, including a washer/dryer, a grill, and wireless internet. 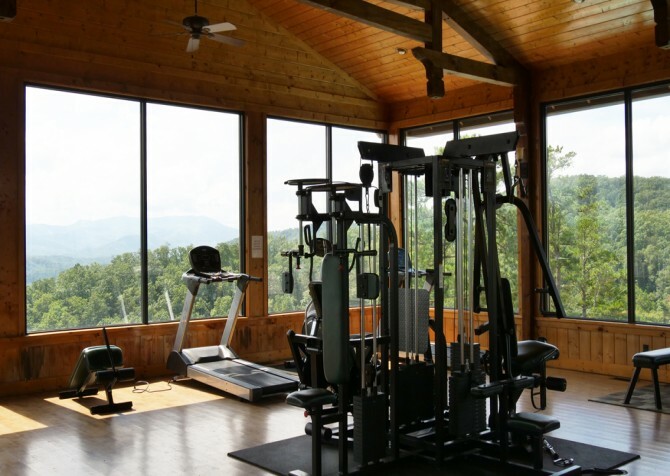 In the Legacy Mountain Resort, it also boasts great community amenities, including a beautiful pavilion with seating and a fireplace and TV, an exercise room with gorgeous views, a steamroom/sauna for post-hike relaxation, and space for outdoor weddings! When you’re ready to just relax, make your way to the living room of Legacy Mountain Lazy Bear. Find the perfect spot on the leather sofa or matching love seat and flip on the big screen TV. The electric (no heat) fireplace makes the room feel cozy, so you can gather here with family and friends. Don’t forget cards or board games; the coffee table in the center of the room is large enough for family game night. Or you can just have snacks and drinks on hand while you’re hanging out. Plus, you won’t miss out on the beauty of the outdoors here. Several windows around the room frame tree-studded views. Legacy Mountain Lazy Bear features a fully equipped kitchen, where you can prepare family meals, make romantic candlelit dinners, whip up easy lunches and snacks, or just have a place to keep leftovers after dinner downtown. Open to the living room, you can easily grab a bite without missing out on what’s happening. 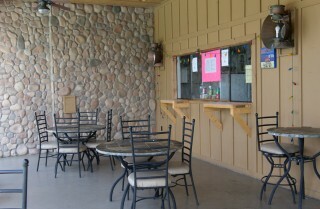 It has enough counter space to prep for meals, along with a breakfast bar with seating for 3. In the kitchen, you’ll find a beautiful blend of form and function. Natural wood cabinets are paired with black-and-stainless-steel appliances for a polished look. The kitchen has a refrigerator, stove/oven, built-in microwave, dishwasher, and enough glasses, dishes, and utensils for all 6 guests. It also has essentials like a coffeemaker, knife set, toaster, and blender to make mealtime even easier. Just stop by the Gatlinburg Farmers Market for fresh produce, pick up your favorites at the grocery store before heading to the cabin, or visit The Old Mill and The Apple Barn for pancake and biscuit mixes, homemade jams and salsas, and more! We also have some great gift baskets at Cabins for YOU that are loaded with local goodies – when you just want a tasty snack or an easy lunch. Next to the kitchen is the dining table with space to seat 4. If you don’t feel like going out to eat, or you just want some cereal or donuts in the cabin before heading out, it will be a nice place to sit down and enjoy some peace. If you’re here as a couple, cook dinner together and sit down for a romantic candlelit evening in the privacy of your own cabin. The master suite in Legacy Mountain Lazy Bear features a king-size bed that will be calling your name after hiking Mt.LeConte, riding roller coasters at Dollywood, shopping around at The Island, or exploring along the Parkway all day. Log nightstands sit in either side of the bed, and lamps offer lighting for late-night reading or easing yourself into the day. You can unpack in the dresser, enjoy tree-studded views through your large window, or just flip on the flatscreen TV and watch movies in bed. You can even start your days and finish your nights with luxurious soaks in the jetted tub in your bathroom! Need some extra sleeping space? The cabin also boasts a twin-over-twin bunk for extra guests! Downtown Pigeon Forge has tons to do, from arcades, miniature golf courses, and laser tag arenas to go kart tracks, family-friendly attractions, and museums. But when you want to play without getting out of the cabin, Legacy Mountain Lazy Bear has you covered. The rec/theater room serves double duty, with entertainment for kids and adults. 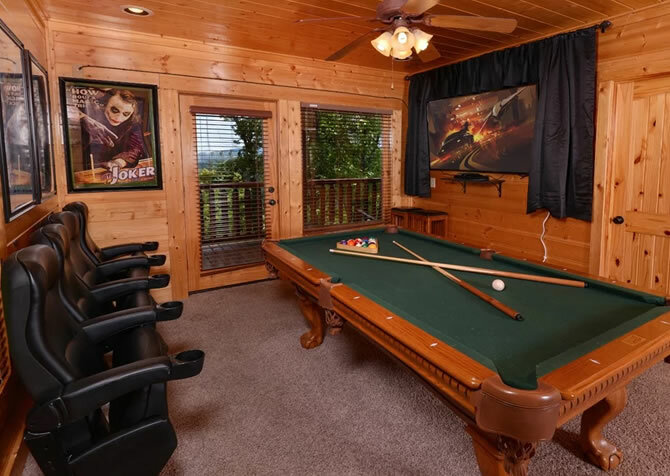 You can shoot some pool before getting some fresh air on the deck (easy access here), or you can plan a movie night in the cabin. It even has a 60-game multicade for classic and kid-favorite arcade games! Just pop some popcorn, grab a drink, and find a comfy spot in one of the theater-style seats. Bring along your favorite movies, and you can take advantage of the 65-inch smart TV, DVD player, and Blu-ray player! You can stream your own Netflix account on the smart TV, so you can watch all your favorites! If you get antsy during movies, you can even shoot some pool while you watch the movie! 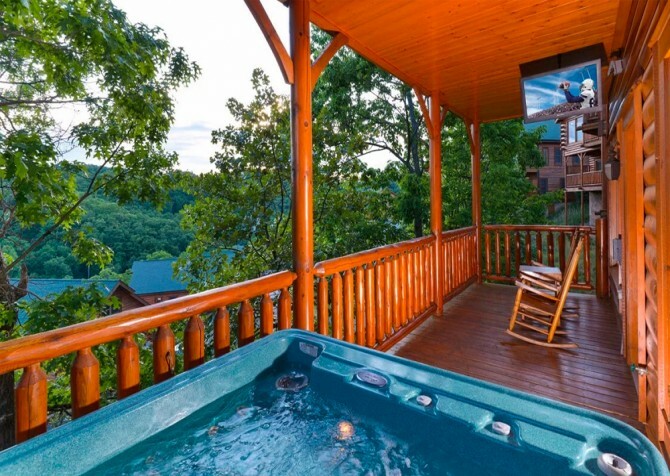 Legacy Mountain Lazy Bear has some great outdoor spaces where you can enjoy the scenery of the Smokies – without even leaving the cabin. Brew a cup of coffee in the morning and start your day by relaxing in the rocking chairs overlooking the trees. This peaceful spot will be just the quiet start you need. At night, grab a glass of wine or a cup of hot chocolate and enjoy the cool mountain breezes washing over you. You’ll have beautiful, unique views year-round, with changing leaves in the fall, snow-covered trees in winter, and blooming trees and greenery in spring and summer. 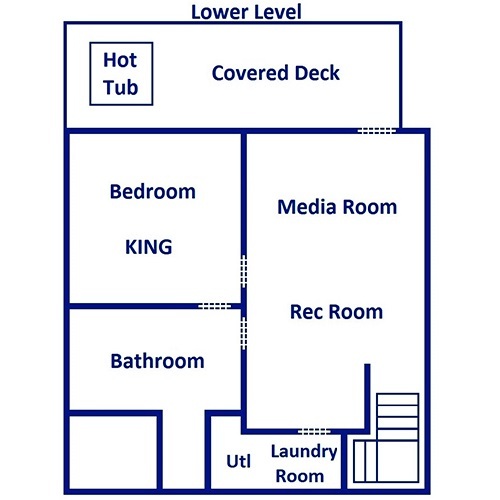 At the end of the day, climb into a soothing hot tub with a TV to unwind. Vacations at Legacy Mountain Lazy Bear are all about fun, comfort, and convenience. With a washer/dryer in the cabin, you can stay on top of laundry or just pack light for the trip. 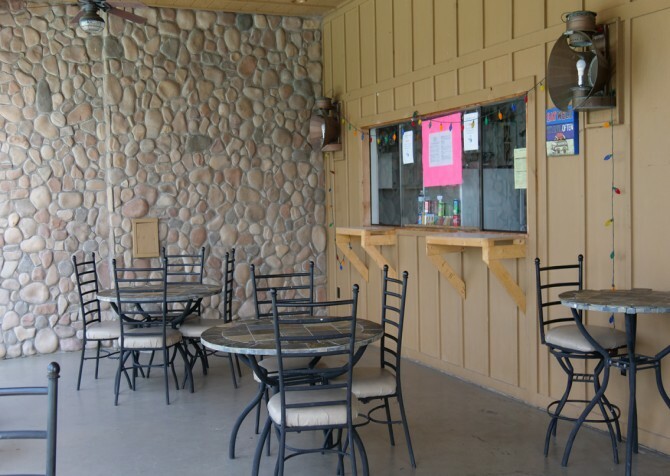 You’ll also have a charcoal grill for cookouts, DVD and Blu-ray players, and wireless internet that lets you stay on top of what’s happening in the area while you’re here! As if the cabin didn’t pack enough of a punch, Legacy Mountain Lazy Bear also boasts great community amenities in the Legacy Mountain Resort. Spend summer days splashing around in the beautiful outdoor pool, unwind in the soothing steamroom/sauna, have a picnic under the gorgeous pavilion (with TV and fireplace), or take advantage of the community center amenities. There is even a beautifully designed exercise room with awe-inspiring mountain views! In the Legacy Mountain Resort, Legacy Mountain Lazy Bear isn’t far from the fun of downtown Pigeon Forge. Whether you want a laid-back week or a fun-filled vacation, you’ll find something to do in town. The community calendar is packed with events like car shows, arts and crafts shows, races, fishing tournaments, holiday parades, 4th of July celebrations, kids’ events, and food and wine festivals. The town features attractions for all ages, from mini golf and laser tag to wineries and historic buildings. With roller coasters, kiddie rides, play areas and splash pads, shops, restaurants, musicals, live shows, carnival games, and more, Dollywood has something for all ages! Ride the Great Smoky Mountain Wheel, break out at The Escape Game, watch the water at the show fountain, listen to live music at the Ole Smoky Moonshine stage, play at the ropes course, grab a bite to eat, and do some shopping at The Island! Explore the RMS Titanic and learn more about its passengers and crew members at this unique Pigeon Forge attraction. You can touch an iceberg, try to stand on sloping decks, walk the Grand Staircase, and more! "We stayed at the Legacy Mountain Lazy Bear and we loved it! Everything was super clean, comfortable and relaxing. We definitely recommend this place!! The views are absolutely breath taking. We can wait to go back!!"